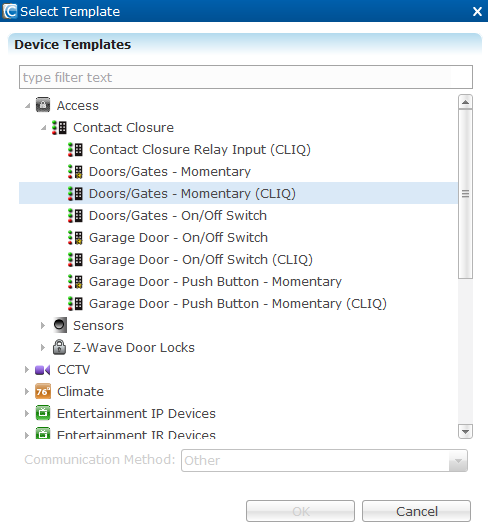 This product bulletin will help simplify installing and programming a doorbell in the CLIQ device. 1. Install the doorbell according to manufacturer instructions. 2. Run the contact closure wires from the doorbell button to the CLIQ device, connect one wire to an IO port on the back of the CLIQ (e.g., port #1), and then the other to its adjacent 12 VDC port. See Figure 1, item 1. Some wires may not be exposed. If necessary, cut and strip the ends for exposure. When wiring devices, ports 1 and 2 share the same 12 VDC power and ground, and ports 3 and 4 share the same power and ground. 3. Run the wires from the bell to the power supply and CLIQ device. Connect the wire from the bell to NO (normally open). Connect the wire from the transformer to C (common). See Figure 1, item 2. Add the doorbell to your Fusion product. You will need to configure the doorbell button and the bell for doorbell operation. Configuring the doorbell button is the first step in programming in Fusion. You will need to know the connection ports and voltage you are working with. 1. Log into Fusion, and then open your project. 2. Click the Devices tab, and then click the New Device icon. The Select Template dialog displays. 3. Browse to Access > Sensors > Sensor Input (CLIQ), and then click OK.
4. In the Details tab’s Name field, enter a name for your doorbell button – for example, Doorbell Button. 5. Click the Configure tab, and then expand the On/Off State property. Select the connector number and voltage from the drop-down fields in the Configure tab. The selections should match the connector you are using, and the voltage should be that of the device you are connecting (12, 24, or 5). See below. Note: This automatically creates a service for the device. After configuring the doorbell button, add and configure the bell. 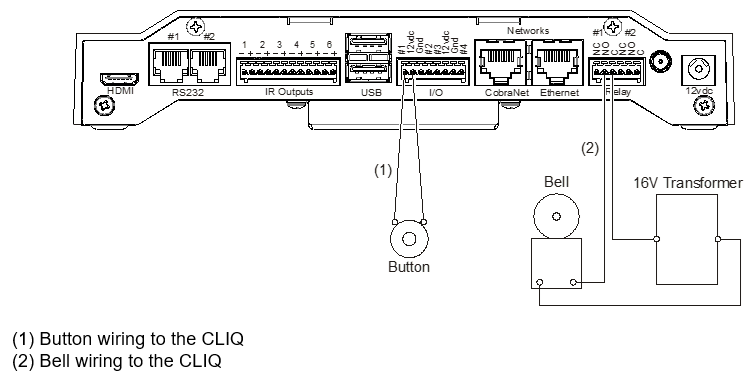 You will need to know the connector number that you used when installing the bell into the CLIQ controller. In the previous example, we chose CLIQ.host Sensor 1. 1. Click the Devices tab, and then click the New Device icon. The Select Template dialog displays. 2. Browse to Access > Contact Closure > Doors/Gates-Momentary (CLIQ), and then click OK.
3. In the Details tab’s Name field, enter a name for the bell. 4. Click the Configure tab, and then select the connector number that corresponds to the bell. Once the devices have been installed and added in Fusion, you can create a scene for the doorbell. In the scene, you can have multiple actions. We are creating a scene for pressing the doorbell button. Once pressed, the bell will sound and the front door camera will activate. We are adding an action to trigger the bell, and another to trigger the camera. 1. Click the Scenes tab, and then click the New Scene button. 2. The Scene Info field displays. In the Scene Name field, enter a name for the scene – for example, Door Bell Scene. 3. Click Add Action. The Add Action dialog displays. 4. 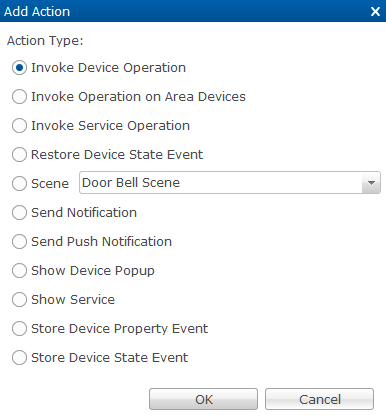 Select Invoke Device Operation, and then click OK.
5. Configure the Scene Info field, as shown below. Click the hyperlink to select the device wanted, in this case the bell. 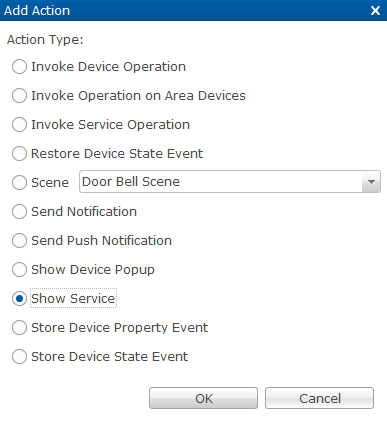 Note: The Device field will display the text “Generic Door Bell”, it will not display the name you assigned to the bell. 6. Click Add Action to display the Add Action dialog. 7. Select Show Service, and then click OK.
8. Select the camera you want shown from the service dropdown list, and then make sure that the Visible checkbox is selected. After configuring the scene, you must create the rule. In our example, we will ring the bell ring and display the selected camera service when the doorbell button is pressed. 1. Click the Create Rule button in the Scene Info field. Click the Rules tab and click the New Rule button. 2. Name the rule, and be sure to select the Enabled checkbox. 3. Configure the Event Part fields, as listed below. In the Event Type field select Device Property Value Event from the drop-down list. Click the hyperlink displayed in the Device field to select the doorbell button. Note: The Device field will display the text “Generic Doorbell Sensor Button”, it will not display the name you assigned to the button. After deploying the project you will have a fully operational doorbell. It will be configured to ring the bell and activate the camera you selected. Once the doorbell is pressed, the camera will show on your iOS device or Android smartphone.